In yet another in a series of solid monthly reports on the status of the US labor market, payrolls rose 215,000 last month and the unemployment rate ticked up slightly, but for a good reason: more people entered the labor force looking for work. Wage growth remains subdued, up 2.3% over the past year. 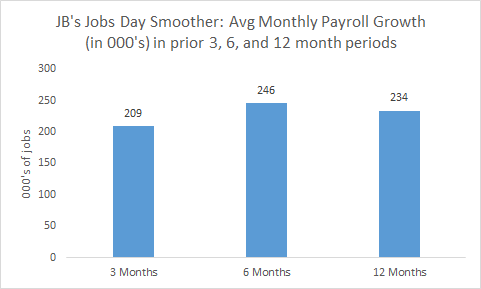 That’s a bit faster than earlier in the recovery, but still reflecting the fact that while the job market is clearly on a reliable, tightening path, some slack remains and many workers still lack the bargaining power they’d have at full employment. I’ll get into this a bit more below, but as noted, the labor force participation rate (LFPR) ticked up to 63% last month, back to where it was in early 2014, and half a point higher than its recent trough, representing about 800,000 more people in the job market. Especially given the fact that unemployment’s stayed nice and low as these folks have joined the fray, this is, as noted, a positive development. With consistent job growth of this magnitude, we should hope to pull more labor market sideliners back into the game, and that may be occurring as per the recent uptick in the LFPR shown below. This critical metric has far from recovered off of its recessionary lows, but since the LFPR reflects demographic change–more retirees will lower it in a way that says more about aging boomers like myself than labor demand–we shouldn’t expect to go back to levels that prevailed under a younger age structure. That said, at least some of the loss in the LFPR could and should be recouped, and I’ll vigilantly track this apparent trend reversal circled at the end of the figure to see if it sticks. As noted, a blemish in recent jobs reports is the impact of the strong dollar on manufacturing, which shed 29,000 jobs last month and 18,000 in February. When the dollar strengthens relative to the currencies of our trading partners, it makes our exports more expensive to them and their exports to us cheaper, thus exacerbating our trade deficit and hurting export-oriented sectors, like manufacturing. The figure below, which indexes overall payrolls without factory payrolls and also plots the latter, shows the sharp divergence since the dollar picked up strength around a year ago. Wage growth was 2.3% over the past year, the same pace as in February. That’s a bit off its faster pace towards the end of last year, and is a notable indicator that slack remains in the job market (workers still don’t have the bargaining power they’ve long lacked). The underemployment rate, which adds in the approximately 6 million involuntary part-timers, ticked up slightly to 9.8% and remains highly elevated. My estimate of the underemployment rate commensurate with full employment is 8.5%, so we’ve a ways to go there. Finally, let’s take a bit of a bird’s-eye view of the US economy and job market. Broadly speaking, we know three things (don’t laugh, three’s pretty good for economics): 1) GDP growth has been on the slow side; we’re almost 7 years into an economic expansion and we still haven’t closed the output gap (i.e., the gap between real GDP and where real GDP would be if labor and capital were fully utilized) or achieved truly full employment, 2) job growth has been consistently solid, and 3) therefore, productivity growth–the growth of output per hour–has been decidedly weak. This is actually simple math, because job growth = GDP growth – productivity growth (technically, it’s “total hours worked” growth left of the equals sign, but that doesn’t affect the bird’s eye analysis). In fact, economists of all stripes would agree that productivity growth, currently running at trend levels below 1 percent, is our biggest problem right now, though yours truly would add “the absence of full employment” to the top of that list. And, importantly, they’re related. Intuitively, if demand/growth/output is on the weak side, yet the pace of the efficiency gains with which we produce that output is also weak, then you need more workers to generate a given level of output–that’s all the little formula above is saying. Given that fact, you might argue: well, if that’s the arithmetic, then why in Buddha’s name would we want faster productivity growth? Wouldn’t that just whack the one reliably solid thing we’ve got going right now (job growth)? Not necessarily at all, as faster productivity growth translates into faster GDP growth (ask your fifth grader to rearrange the equation above if you want to prove that). But also consider this: low productivity growth may get you more jobs, but it doesn’t help you with job quality. There are critical distributional issues to consider–far too little of the benefits of productivity growth flow to middle and low-wage workers. But unless the productivity pie starts growing faster, it will be even harder to cut bigger slices for working class families. Simply put, the progressive goal is not simply a greater quantity of jobs; it’s jobs of decent quality. Importantly, lasting full employment helps with both of those problems. By definition, it implies enough jobs to meet the supply of workers. But when the job market is at full employment, pressure builds to push up labor costs and wages and compensation begin to get a bit of traction, as we’ve begun to see in recent job reports. At the same time, employers seeking to maintain their profit margins must find new efficiencies and shed sloppy inefficiencies that were affordable in periods of persistent slack, with no pressure from labor costs. I’ve called this the full employment productivity multiplier. So, steady as she goes. 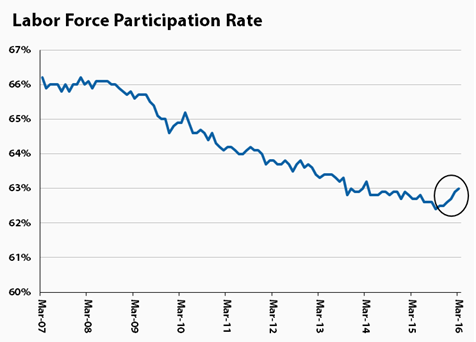 The job market continues to firm up and labor force participation is finally getting what looks like a nice bump. That said, the strong dollar is taking its toll of factory employment and underemployment remains much too high. There’s a lot more room for wages to pick up as well, which is what it will take for working people to feel the benefits of overall growth. 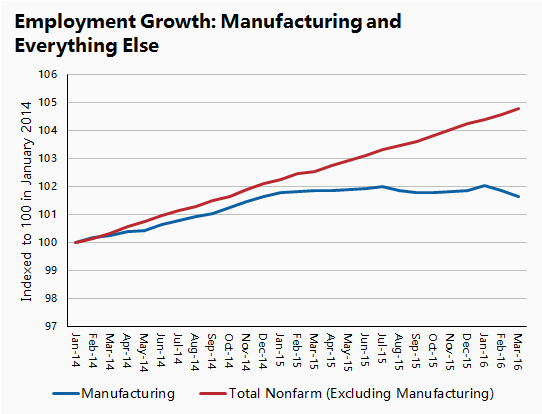 Share the post "Jobs Report: Another solid month, LFPR on the rise, but manufacturing hit by the strong $"
2 comments in reply to "Jobs Report: Another solid month, LFPR on the rise, but manufacturing hit by the strong $"
Good ?. Real trade weighted dollar up 15% over past 2 yrs; trade deficit in goods expanded and reduced growth by 0.5-1 ppt (off top of head; not checking); trend in manuf flattened, as shown.